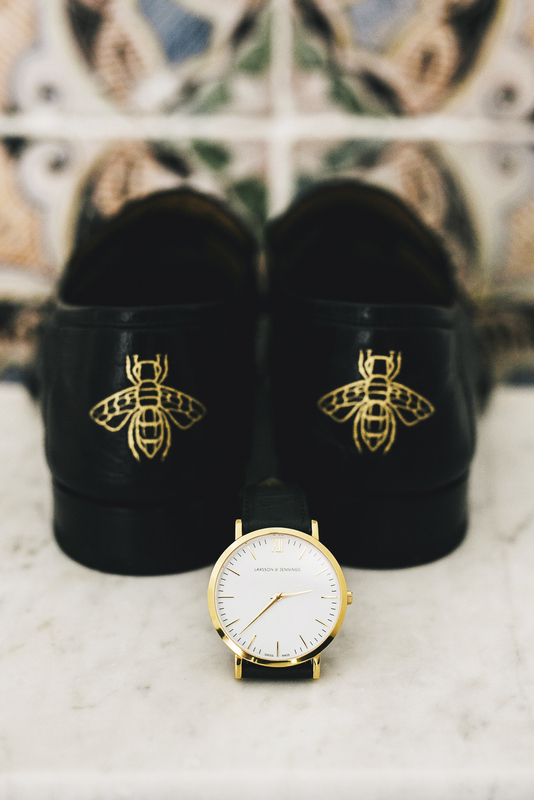 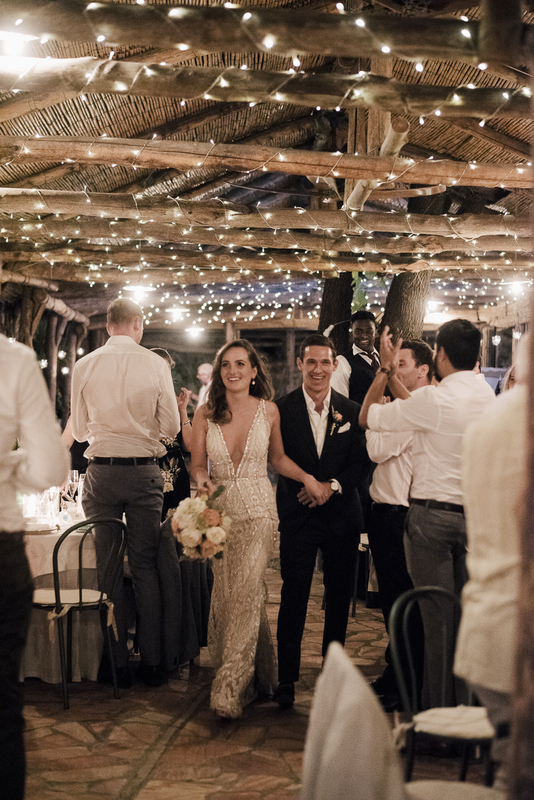 After spending a few years in London, a capital rich in history but with a generally cold climate, Harrison and Robyn moved to the warmer climes of Sydney, Australia where they discovered a deep love for the sea and the coast in a more temperate climate. 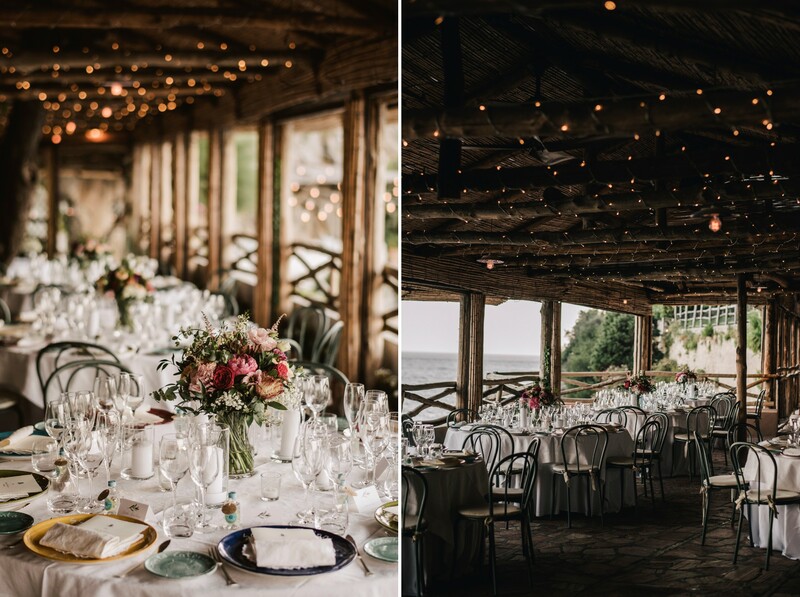 When they decided to get married, they immediately thought they wanted to do it in a warm place, close to the sea where they could share their special moment with close friends and family, at the same time sharing their great passion for travel and adventure. 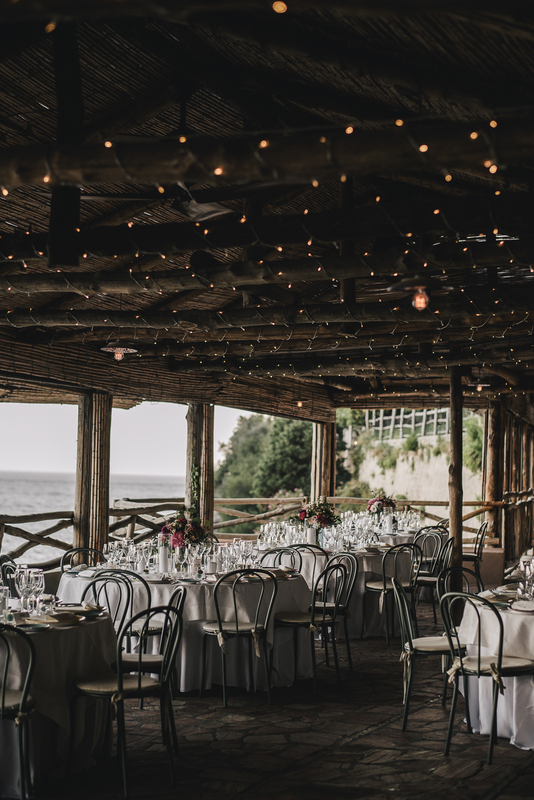 The idea of ​​a destination wedding on the Amalfi coast, one of the most famous places in the world for its breathtaking coastal panoramas and the marvelous beaches, all bathed in the warm kiss of the sun. 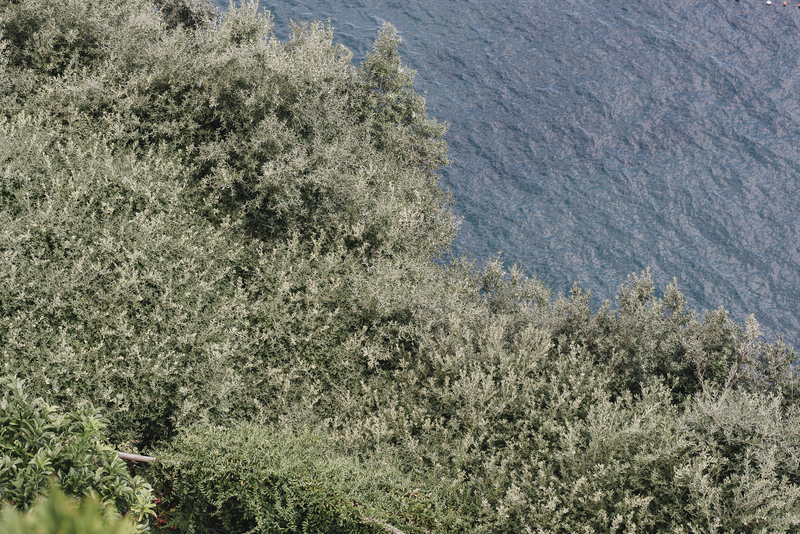 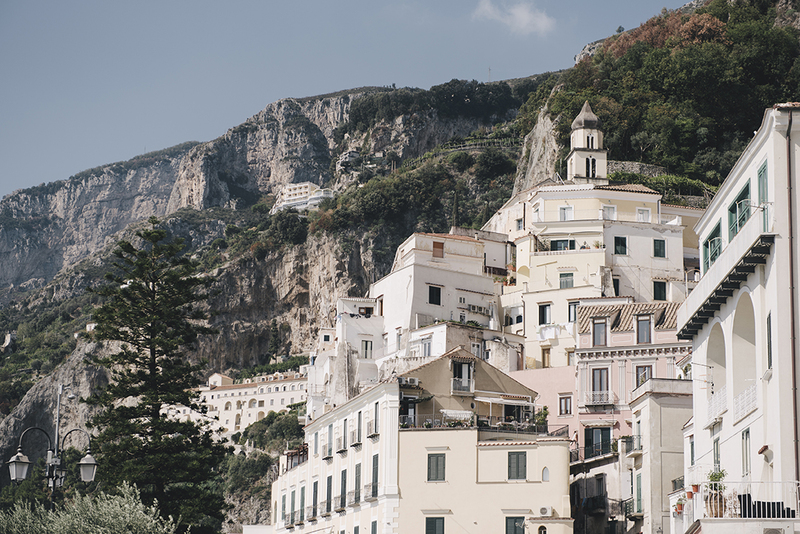 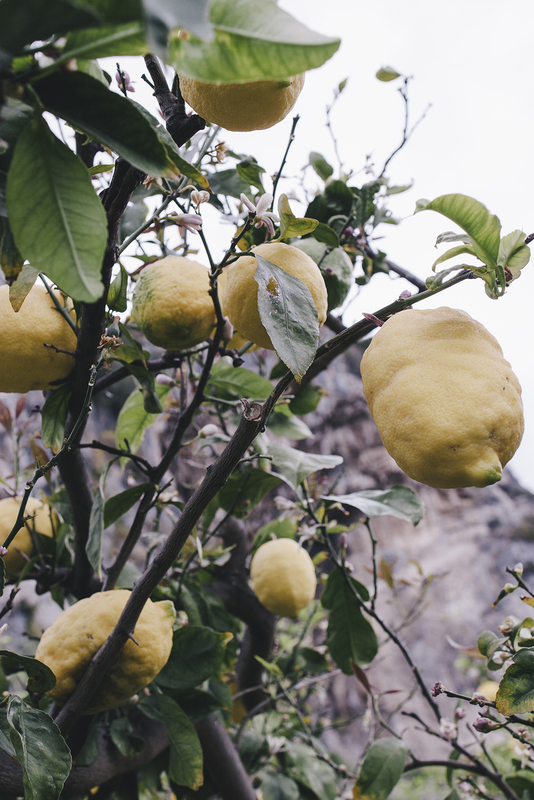 Amalfi stands in a deep gorge at the foot of Monte Cerrito surrounded by cliffs and the sea. 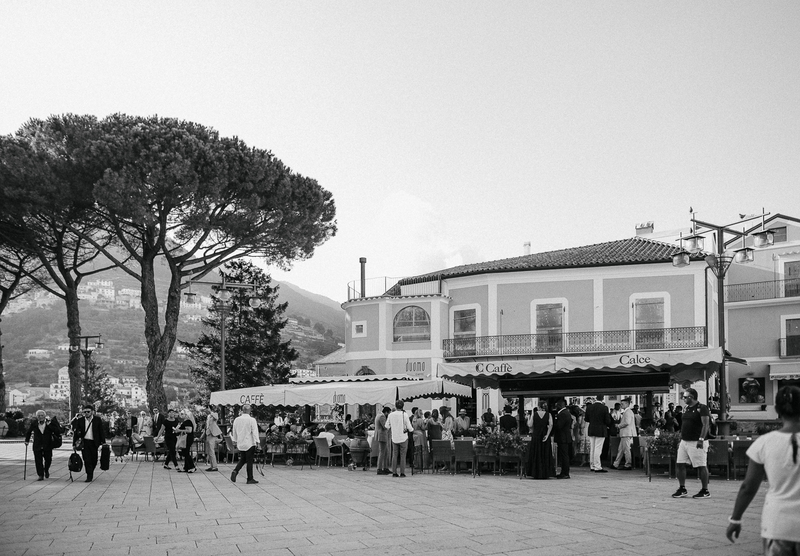 The town was an independent republic from the seventh century to 1075. 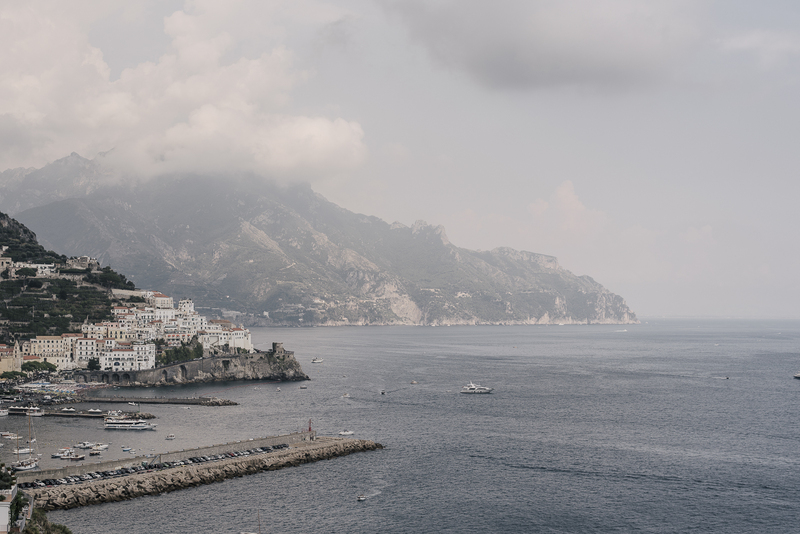 The Maritime Republic of Amalfi was one of four major maritime powers with Pisa, Genoa and Venice. 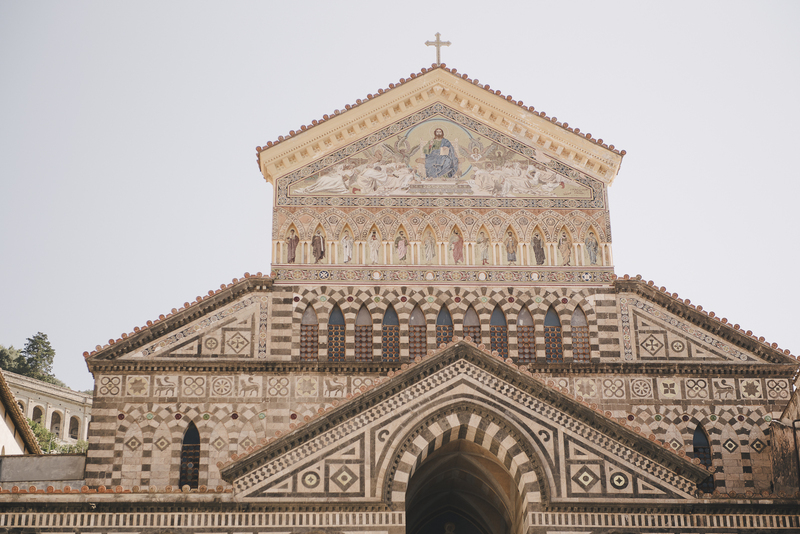 The cathedral with its magnificent campanile date back to the 13th century. 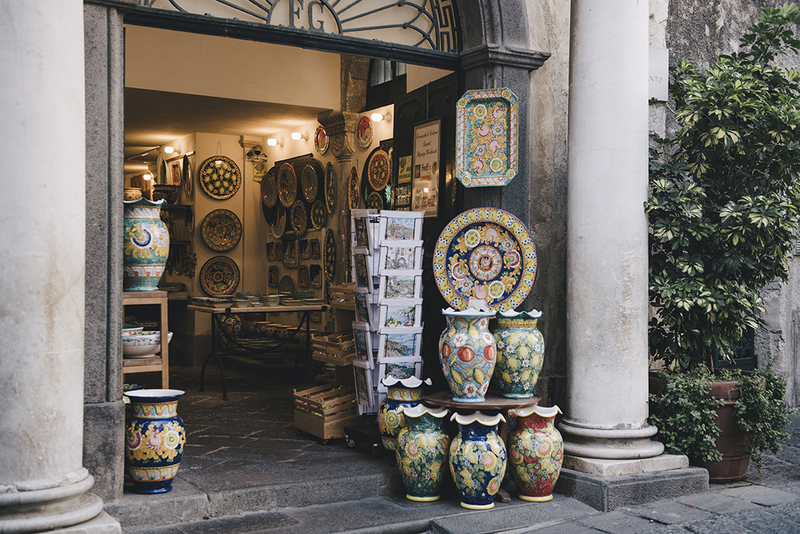 Beside the cathedral is the Cloister of paradise which houses ancient mosaics and paintings among 120 columns constructed in the Arabian Style. 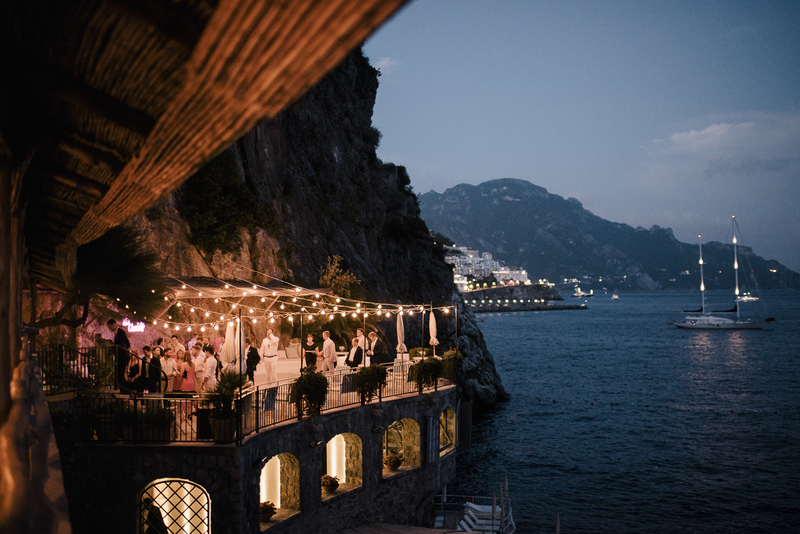 Blue and yellow mosaica, a cascade of colorful houses, towers, churches and alleys all leading to the sea, make Amalfi a spectacular venue for destination weddings at any time of the year. 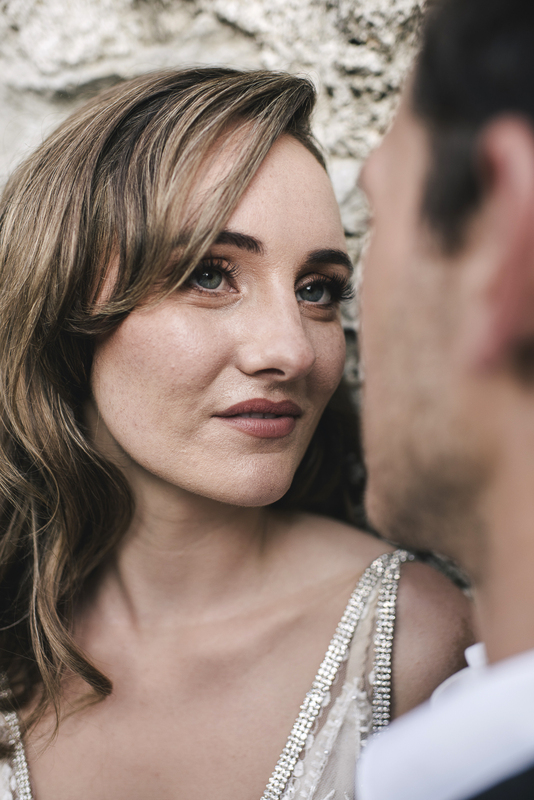 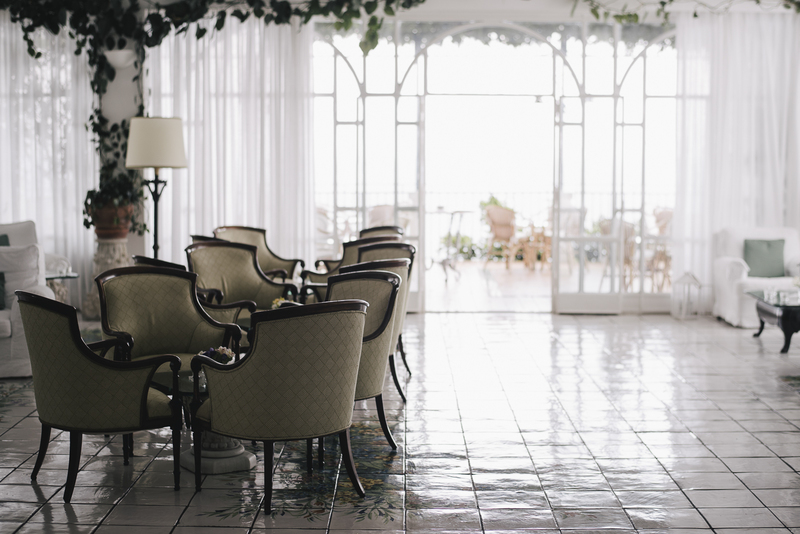 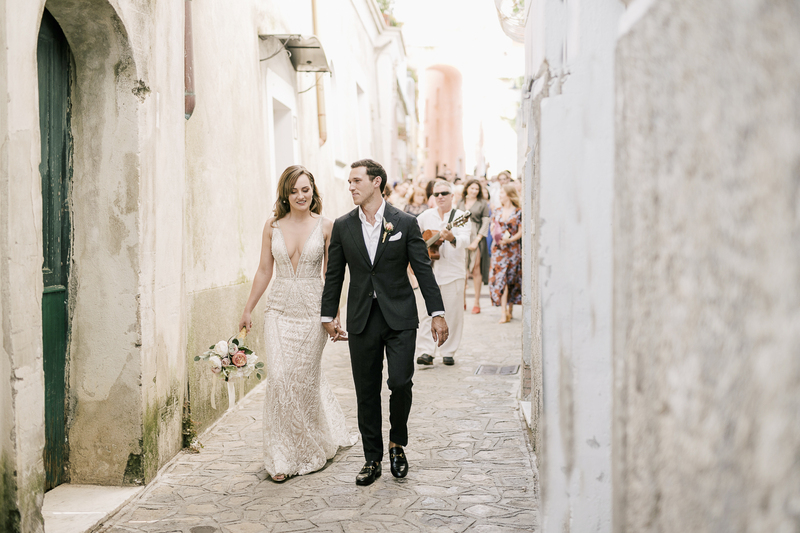 Robyn and Harrison chose the Hotel Santa Caterina for their wedding, one of the most beautiful wedding location on the Amalfi Coast. 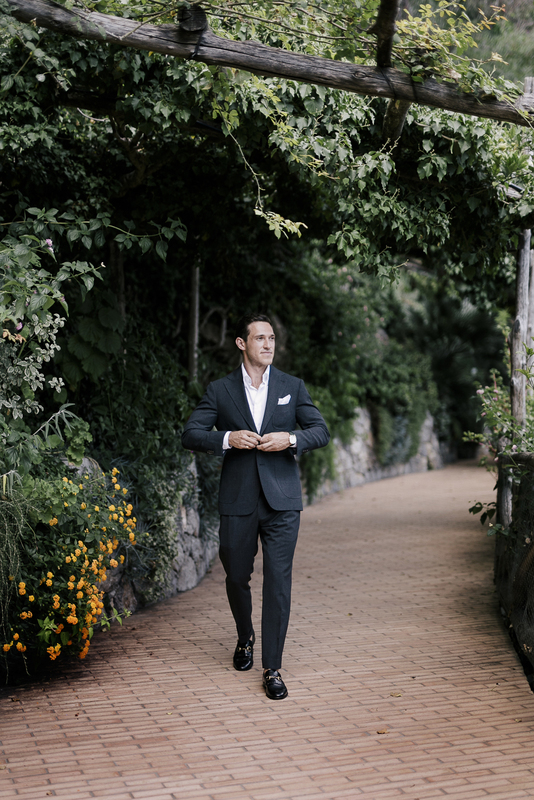 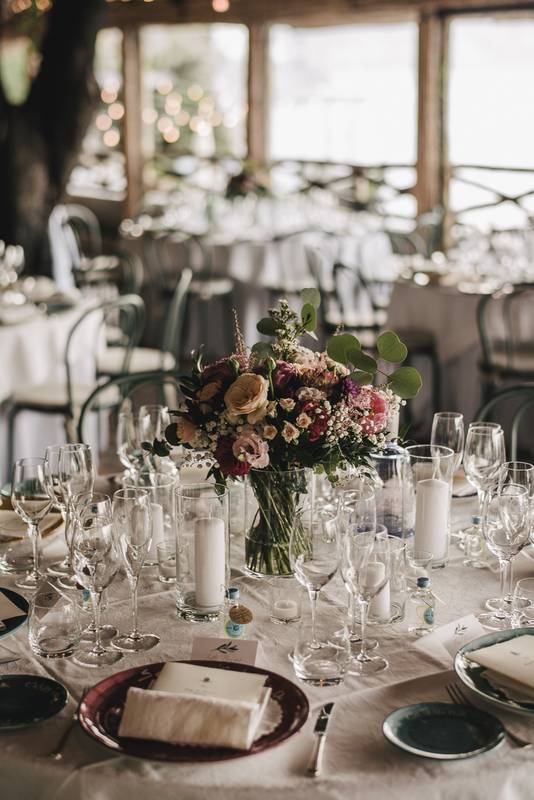 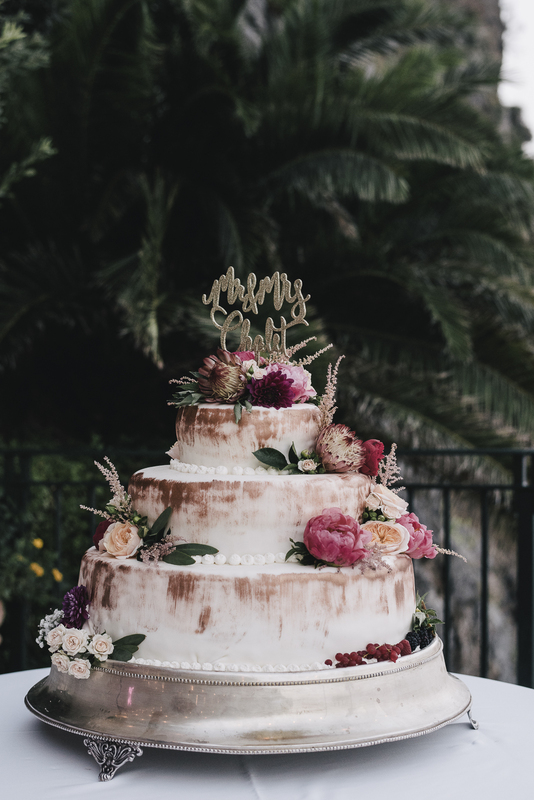 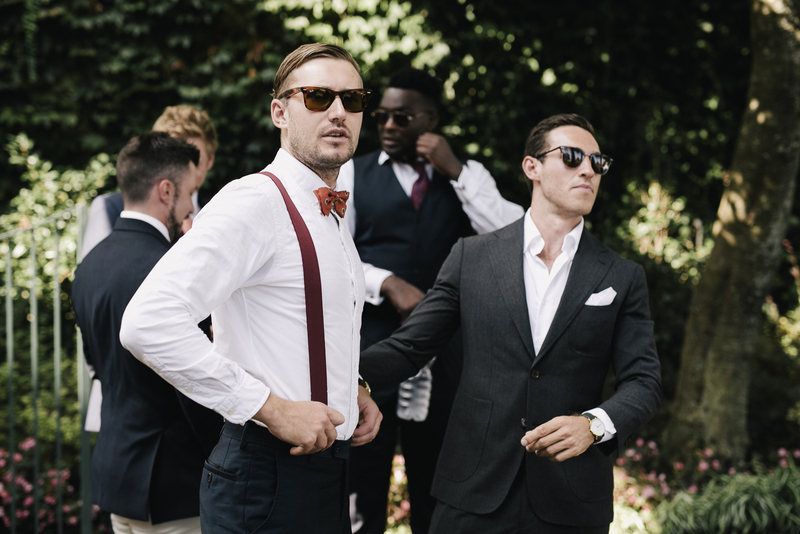 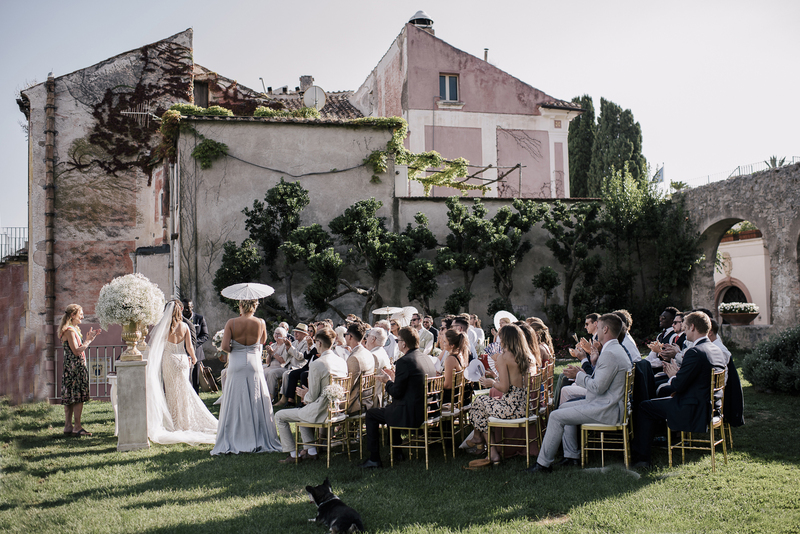 Before moving on to the Hotel Santa Caterina, all the guests gathered at the famous gardens of the Principessa di Piemonte, one of the most evocative viewpoints of the whole Ravello, for the ceremony. 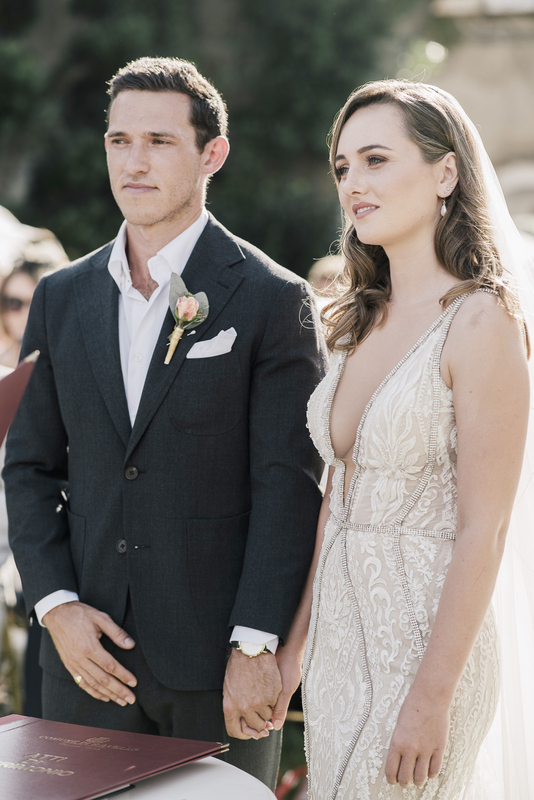 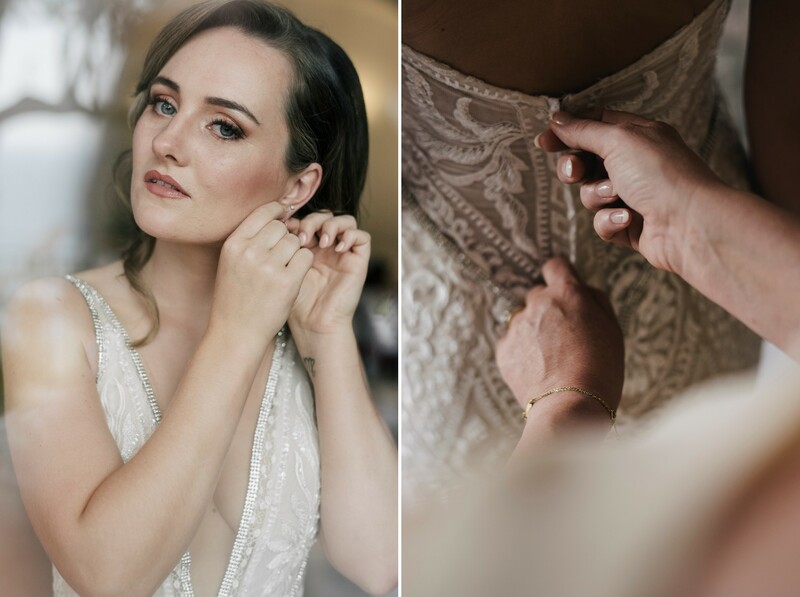 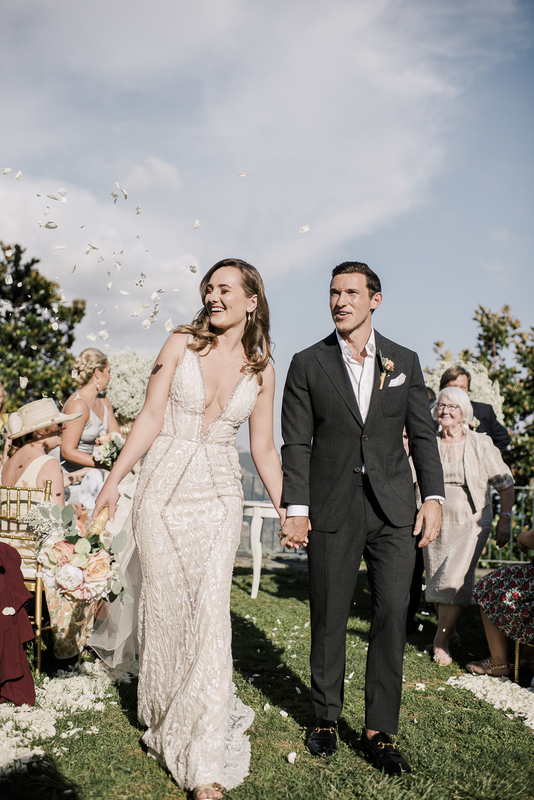 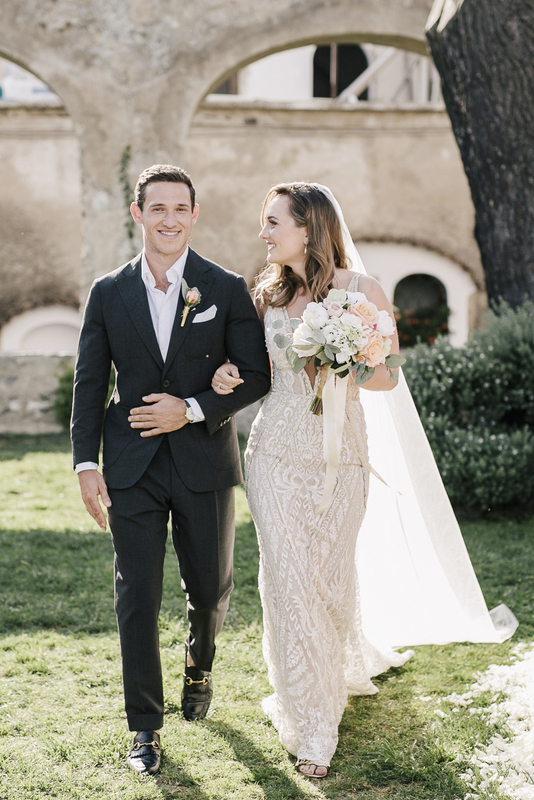 Here, in a wonderful and seductive Galia Lahav dress, entirely made of lace and with geometric accents in embroidered crystal, Robyn joined Harrison for the wedding ceremony. 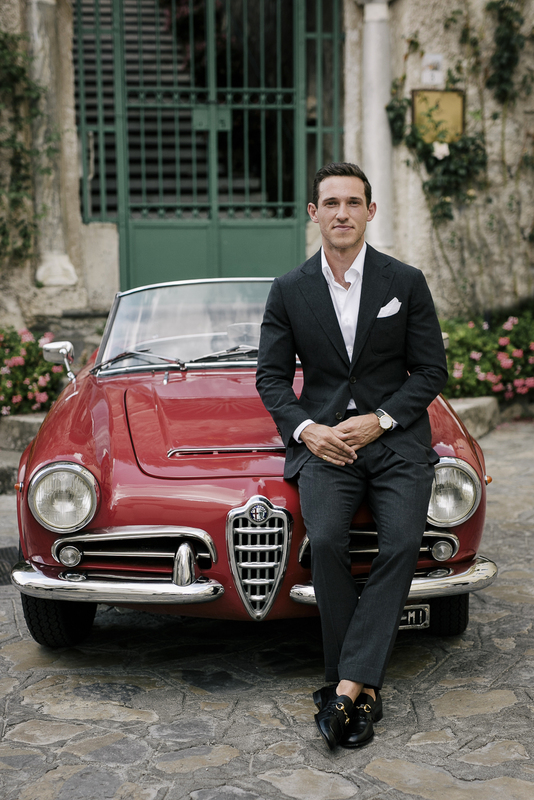 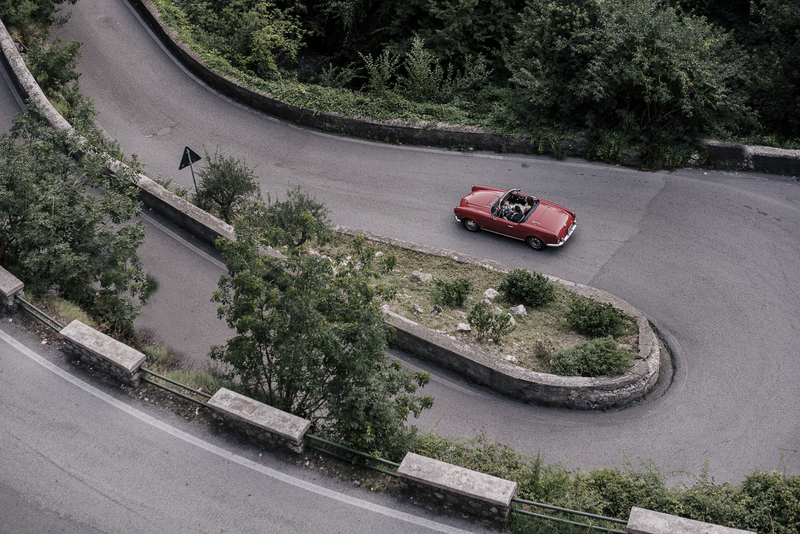 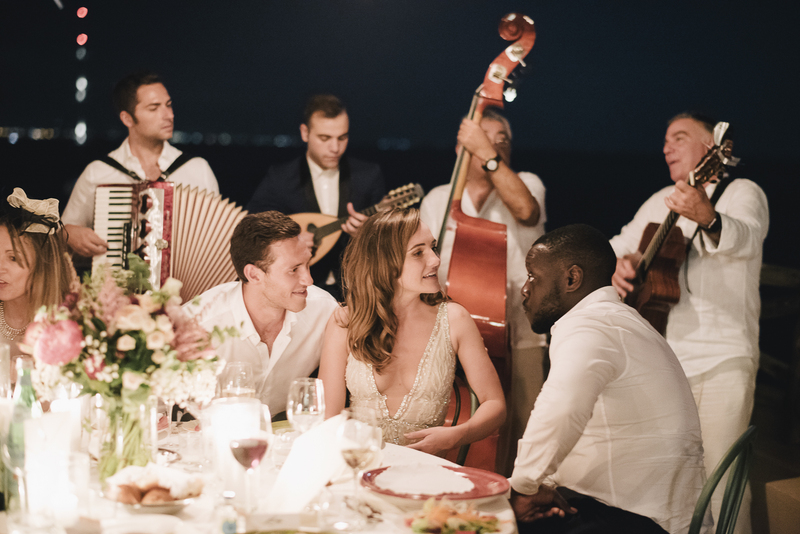 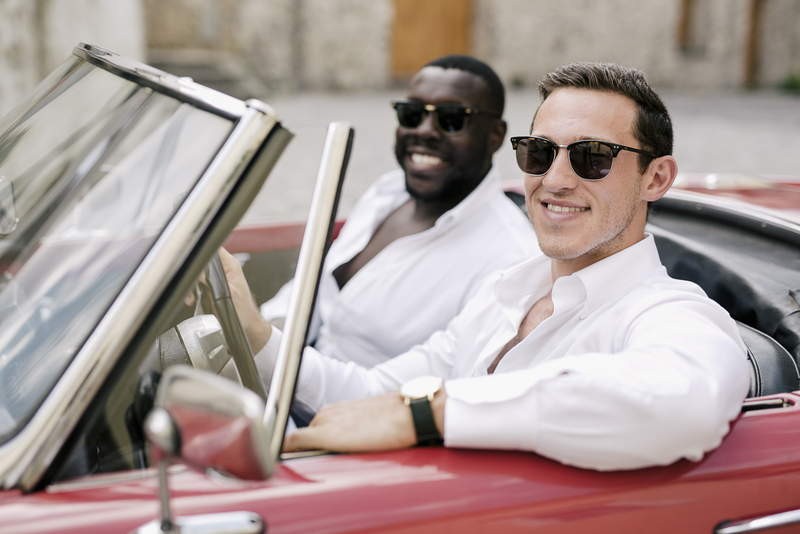 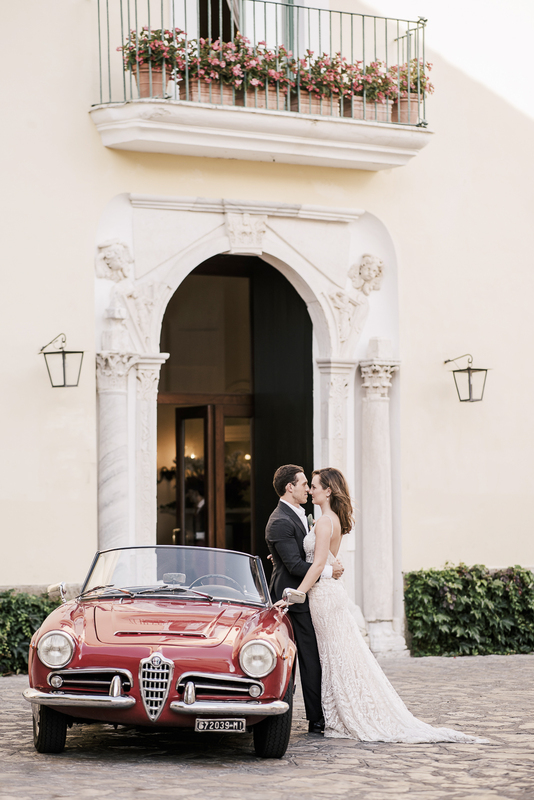 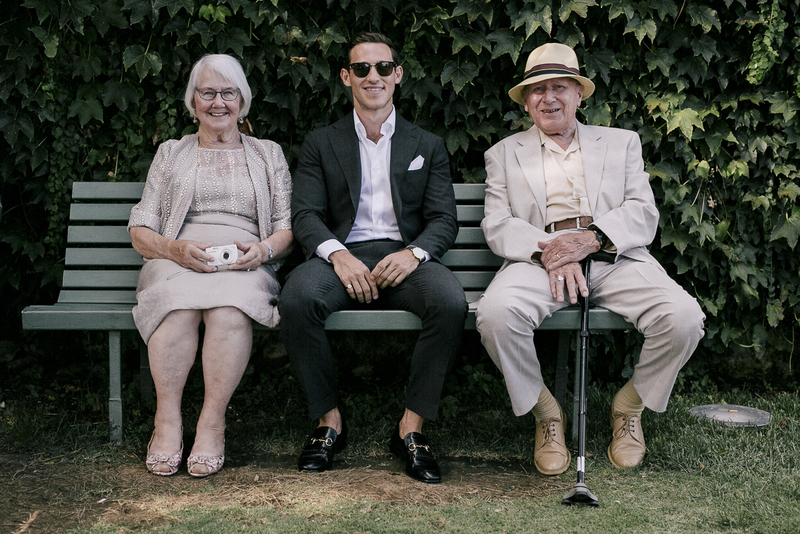 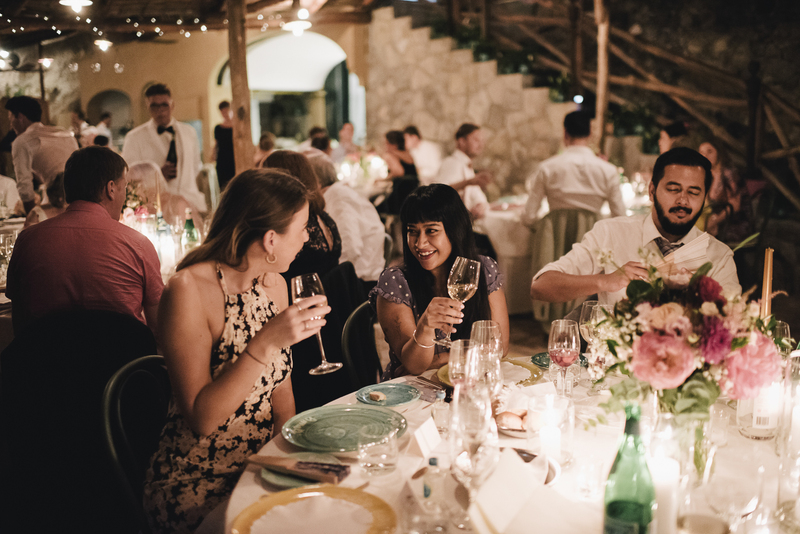 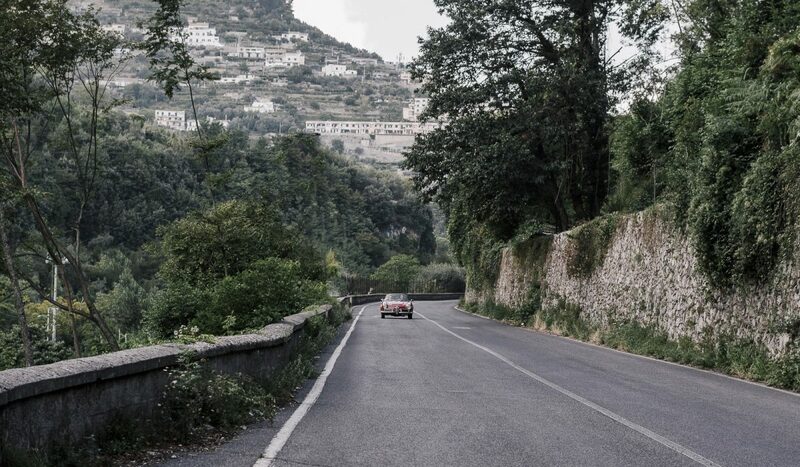 After the ceremony and refreshment at the historic Bar Calce in Ravello’s main square, in a 1964 red Alfa Romeo Giulia Cabriolet, Harrison drove his bride to Amalfi, to meet again with all the guests and enjoy a delicious dinner on the terraces of Santa Caterina. 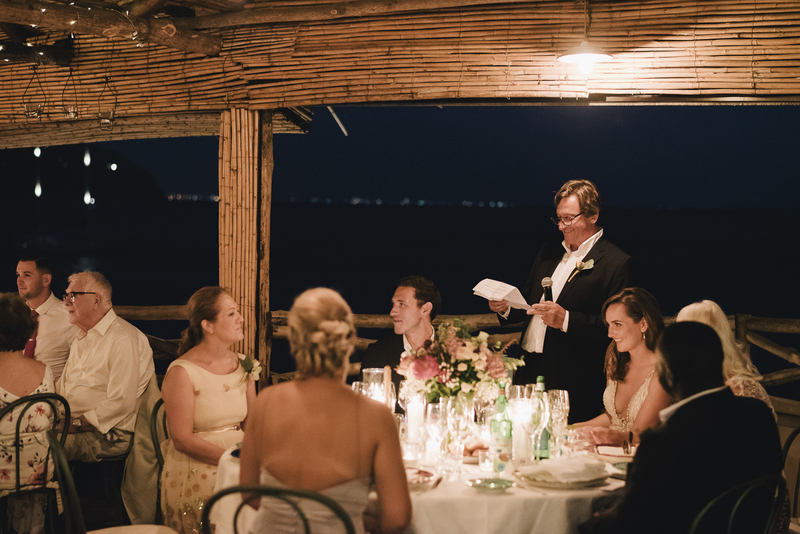 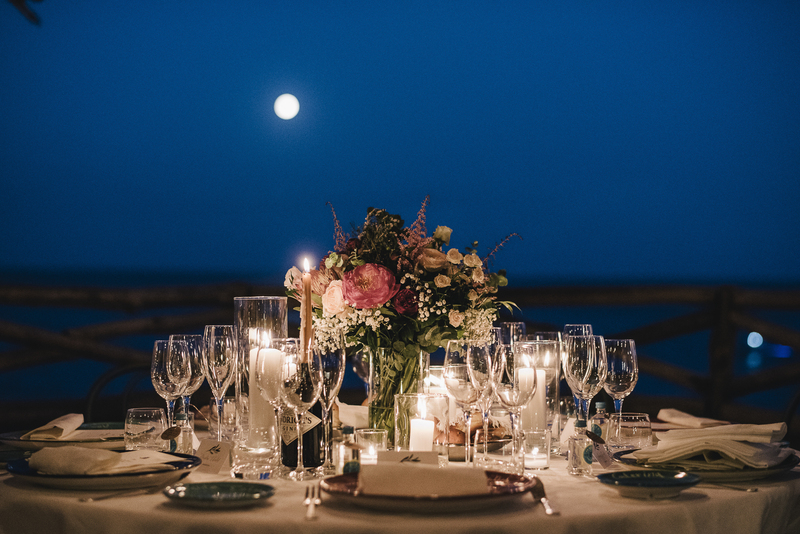 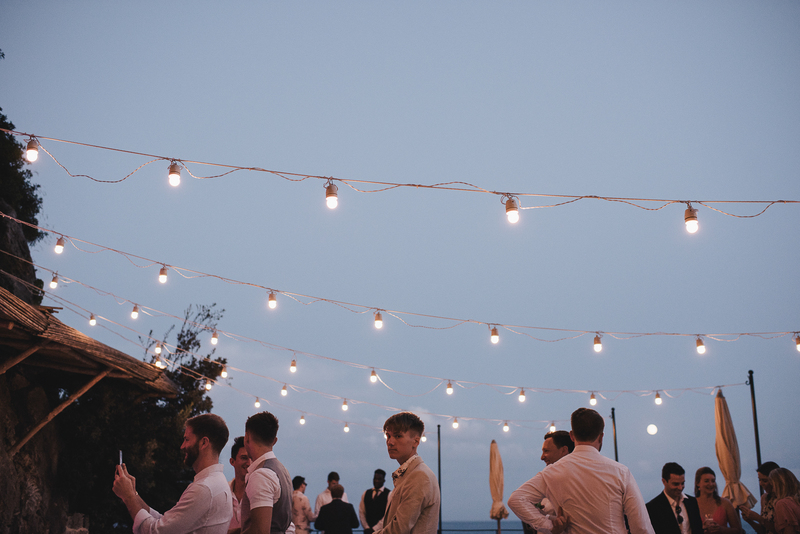 In the seductive atmosphere of lighted candles, wrapped in the intense blue of an Amalfi Coast summer evenings , with warm shades of peonies, roses that embellished the tables and decorated the wedding cake, the day was happily completed. 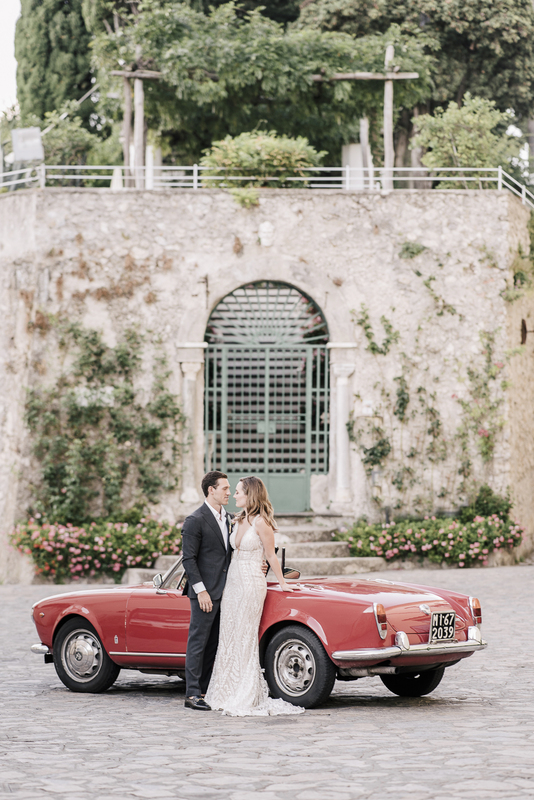 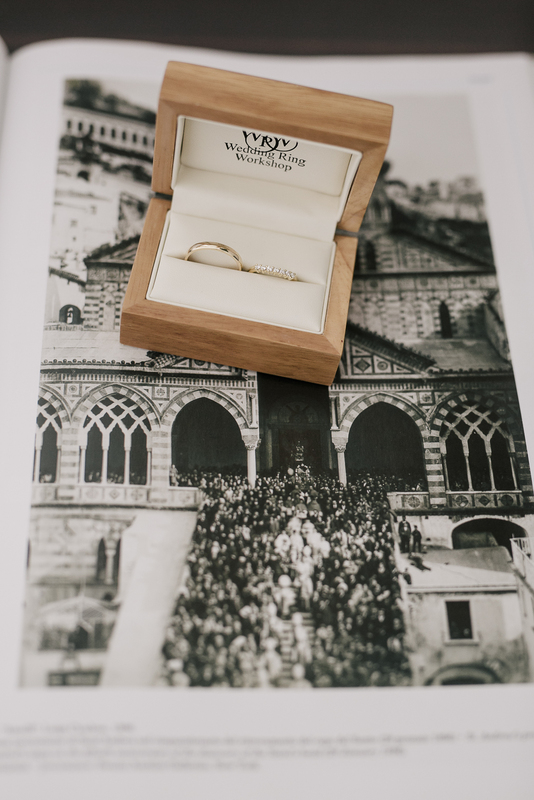 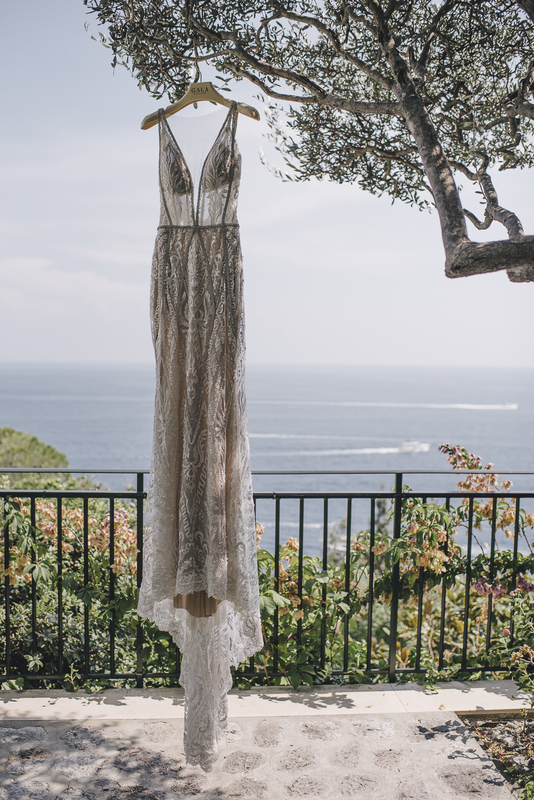 Are you dreaming about a destination wedding on the Amalfi Coast? 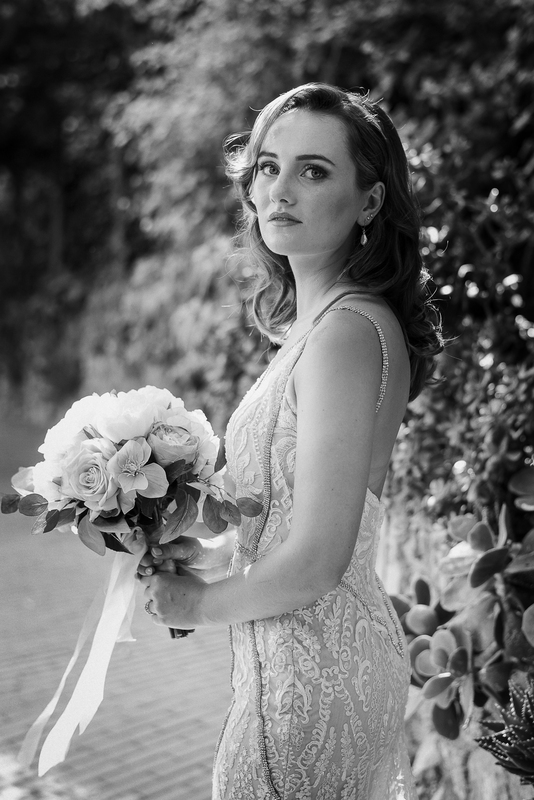 And are you still looking for your photographer? 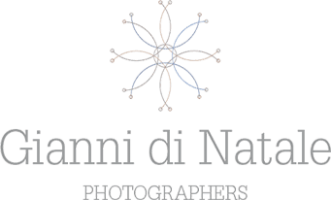 Have a look at our recent works (The Charm of Amalfi for a destination wedding in Italy, Kristina & Joshua and A bright and classy summer wedding in Amalfi, Kimberly & Christopher) and get in touch using our contact form!